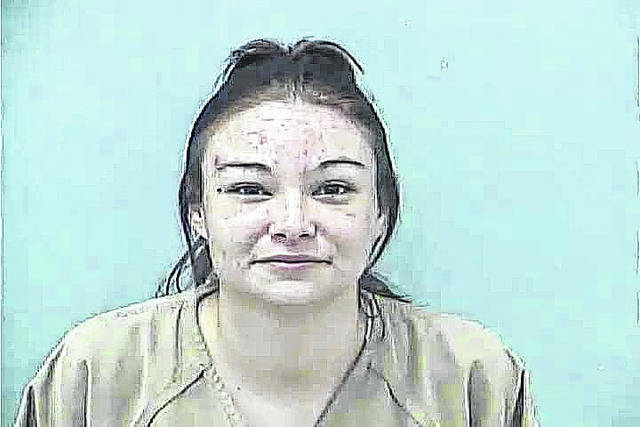 A Blacklick, Ohio, woman was sentenced to three years in prison Monday in connection with an August 2017 incident where she stole clothing from a store at the Tanger Outlets mall, fled police, had her tires shot out, and crashed her vehicle. Alana Marie Hissong, 28, appeared before Delaware County Common Pleas Judge David Gormley Monday to be sentenced for robbery, a third-degree felony; one count of failure to comply with an order or signal of a police officer, a third-degree felony; and one count of operating a vehicle under the influence of alcohol or drugs, a first-degree misdemeanor. Hissong pleaded guilty to the charges at a hearing in January and said at that hearing that on Aug. 8 around 7 p.m., she stole clothes for her children from a store at Tanger and made her way to her truck. She said she heard someone yelling, but didn’t hear what they said. Hissong said her window was smashed out by someone and said as she was pulling out of the parking lot someone shot at her. Hissong said she drove her truck a few miles away before crashing. At that point, she was taken into custody. Hissong said she was under the influence of alcohol and drugs at the time. Assistant Prosecuting Attorney Douglas Dumolt told Gormley that Delaware County Sheriff’s deputies Alex Richison and Josh Clarke were attempting to stop Hissong from leaving when Richison broke her window. Dumolt said Clarke was standing near the rear of the truck as Hissong backed it up, which caused him to lose his balance and fall into the roadway. Clarke reportedly sustained a concussion and abrasions from the fall. Dumolt said Richison saw Hissong’s truck facing Clarke and discharged his firearm at the truck’s tires, but said that Hissong steered around Clarke as she left the parking lot. At the sentencing hearing on Monday, Hissong’s attorney, Dominic Mango, said Hissong was in an altered state of mind when the crime occurred and said she would not have reacted the same way now. Mango said since her arrest in August, she has changed her attitude and sought help and treatment for her substance problems. Mango said she is currently serving a six-month jail sentence in Licking County for an unrelated crime. Hissong’s mother, Diana, said the pictures of her daughter on the news were of “a person I don’t recognize,” and she believed Alana’s arrest was “a wake up call” for her daughter. She added that she will support her daughter as much as can, but ultimately, Alana must overcome her problems on her own. Alana also spoke before her sentence was read and apologized for what she had done. She added that she is currently clean and wants to stay that way. After hearing from all the parties, Gormley sentenced Alana to two years in prison for the robbery charge and one year in prison for the failure to comply charge. Gormley said the sentences will be served consecutively. Gormley credited Hissong the 59 days she spent in the Delaware County Jail during the case and ordered her to pay a $550 fine. Additionally, Hissong’s license was suspended for eight years. Gormley said Hissong can participate in risk reduction programs in prison that may lessen her sentence. Hissong was in the Delaware County Jail Monday afternoon awaiting transport to prison after the conclusion of her Licking County sentence.